This post is more or less a confession on bad parenting. For those who have read my previous posts, you know that I have spent a decent amount of time addressing parenting issues and techniques. I want to be a good parent. But isn't part of being a good parent being willing to admit that you've made some mistakes? And not only that you've made mistakes, but that you'd really like to correct them. So here I am, trying to be a good parent, but seeing day after day that my mistakes and shortcomings directly influence my children; and that can create long- and short-term problems. This is a concept familiar to many parents and others who may work with children for hours and hours every day. Some children have personalities that are more prone to mirroring, but all of them imitate behaviors and vocabulary. That's how they learn to be human. Your responsibility, then, is to provide a decent example of humanity to mirror. Being a good example is easy for an hour, or maybe a couple days. But when these little reflectors live in your house and see you day after day, in stressful situation after stressful situation, they start to see your not-such-a-good-example side. The easiest thing to do to compensate for this is to try to "be good" in front of your kids. I'm not criticizing that; but I would try to extend it in my own life. Extend it to what? 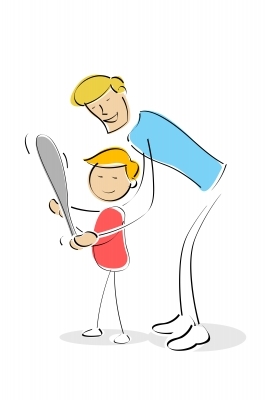 Being a role model for your child(ren) requires that you show them how to behave in their role as a child, not as a parent. I find myself constantly telling my 4-year-0ld son, "I can do that, but you can't" or "I can talk to you this way, but you can't talk to me that way." In other words, there are implied double standards in how we police the behaviors of our kids. Are there things I can do and say that my 4-year-old shouldn't? Yes. But that question misses the point. There are things I should do and say, not because it's my right to do so, but because I want to show my son how to live and talk. For example, many parents, including us, refer to each other as "mommy" and "daddy" when the kids are around (or "mom" and "dad" when the kids get older). Now it's weird and gross to take these titles literally; but we speak that way to each other so that our kids will know how to address each of us. We don't tolerate our kids calling us by our first names. So instead of always saying, "You can't call mommy by her name," I just call her "mommy" so my kids don't get confused. Sure, he'll figure that stuff out later in life; and things will be fine. But let's extend this principle to more important things, like speech patterns and aggressive behaviors. I started noticing several months ago that my son would point at me and make a very angry face when he disapproved of something I had done. Of course, I interpreted this behavior as rude and disrespectful. Then it struck me. I did that to him. Sure, I'm the dad; and I should be allowed to get upset at my son for disobeying or whatever. But I need to teach him how to handle situations in which he feels upset. In other words, how I handle frustration and stress is how he is going to handle it. If I get upset and shake my fist, I can expect to see that behavior from him in a couple days or weeks. Are there clear lines of distinction between kids and parents? Of course! I don't want any readers to get the wrong idea about what I'm trying to say. I am all about parental roles and kids being submissive to their parents. But amidst all of that, parents have the burden of responsibility to not only tell them what is expected, but to show them. If you see the connection, good. If not, Jesus is being baptized in this passage by John, and John thinks it's not a good idea at first. Why? Because Jesus was, according to the Christian faith, God in the flesh. He didn't need to be baptized. Jesus acknowledges that, but goes on to say that it's best for Him to do all these things in order to show his followers what they are supposed to do. So Jesus didn't need to do it, but He did it so He could make it very clear what he expected of His followers. As a parent, am I willing to sacrifice time, money, and energy to make sure that I clearly define the path for my children? Am I willing to humble myself and be inconvenienced so that they can see an image worthy of mirroring? My kids are already reflecting my speech, my behavior, and my habits. I see it every day. The question is, am I willing to adjust my life for their benefit? It's not about telling them all the right things to say and do, it's about showing them how to do it--day after day. The sad truth is that many parents accidentally teach their children to be actors--to jump through hoops rather than becoming genuine people of character. I hope I can avoid being one of those parents. Well said Daniel! I really appreciate! Yes, I had read your previous posts on parenting and as compare to the previous posts, this one is a best one. Actually kids are the mirror of a man, they will learn the same that they will see or realize. To be a good parent, it is necessary to stand as a good person first so that they will learn from you. However, these things are tough to them in Nursery and Kindergartens Nursery School Buford, GA but still parents are also few responsibilities to perform at home. Really one of the best articles I have read ever. Great!